Best Watermelon Knives for Cutting Melons - What About Watermelon? Cutting up a big juicy watermelon often hints that Summer’s here or is nearing close. We all love to enjoy watermelon by the pool but it’s hard to find someone who will put their hand up to cut it. With the right knife, cutting up a watermelon can be as simple as a walk in the park. If you are looking for the perfect knife to cut up watermelons or other melons look no further. 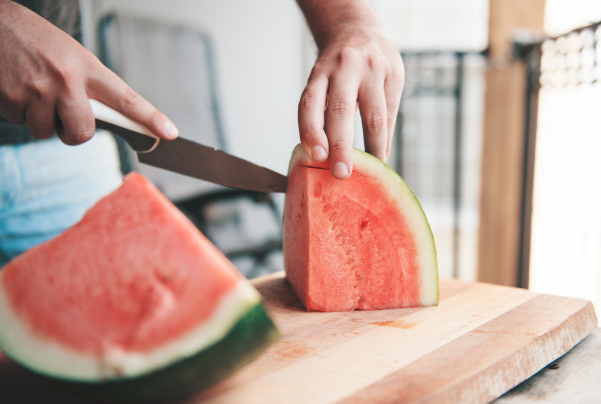 We have gathered a collection of five watermelon cutting knives for you to pick from and the best ways to cut and serve your melons. Cutting Up a Watermelon Should Never Be Hard Work! Below you will find a list of the top knives to simplify the watermelon cutting process. All of these knives can be purchased directly from Amazon and delivered straight to your door. A good quality watermelon knife can make life a lot easier during the warmer months. 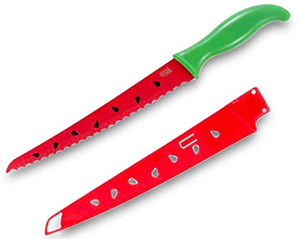 This knife not only has a melon design on the outer, but is also perfect for cutting up watermelons with ease. This knife is created from Japanese stainless steel with a serrated edge. The serrated edge allows it to easily cut through the watermelon skin. This knife is dishwasher friendly and also comes with a case to keep it in tip top condition. In terms of gliding this knife through the watermelon, the ergonomic handle allows one to cut through multiple fruits without cramping. The non stick glaze of the knife’s blade allows any fruit residue to be washed straight off. This stainless steel knife was purposely built for cutting up watermelons. The rigged edge makes it easy to cut through the tough skin of watermelon. The handle is molded to allow for ease of grip while cutting and the colorful designs are aesthetically pleasing. Made of stainless steel, this knife is sure to last many seasons of watermelon cutting. This is a curved blade although approximately measures 10 and a half inches long. This tool makes cutting up watermelon quick and easy. This cutter can be sliced straight into the fruit and then also used as a tong to remove the slice. This cutter has a metal tip to cut right up to the rind of the fruit making nice slices that can be held in ones hand. The mess free approach with this knife has resulted in many happy customers. The grip handle makes it easy to glide through the fruit and the best part is that this slicer can be put in the dishwasher afterwards. 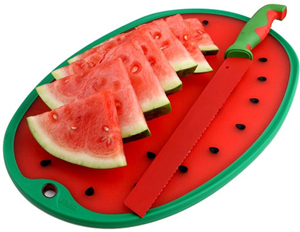 The multi-use watermelon slicer has been created ergonomically with design aspect at hand. This is a carbon stainless steel bladed knife that is crafted for cutting watermelons. 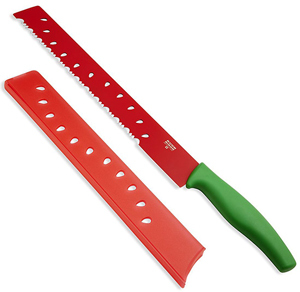 The non-stick finish on this knife allows any excess watermelon residue to be wiped away easily. The grip handle makes cutting many watermelons simple and painless. This is a rounded device that can be sat on a watermelon and pressed down. It measures approximately 13 inches in diameter. 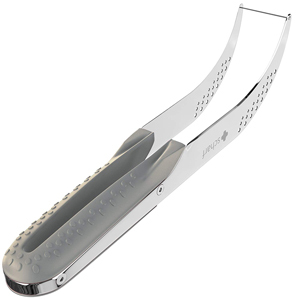 This is a watermelon slicing device although is very different to a conventional knife. This is a rounded cutter that has multiple sharp edges to cut through a watermelon and create instant slices. The blades are made from stainless steel to cut through watermelons and other tough skinned fruits and vegetables. Some customer reviews suggest cutting the watermelon in half makes it easier to use this device. There are both good and bad reviews surrounding this watermelon cutting device. Cutting watermelon shouldn’t take all day. The majority of us cut it up quickly for the kids or in a hurry to get back outside and enjoy the sun. If you’re planning on having a few friends over for a swim and some melon why not invest in a watermelon cutting and serving board. These board are perfect for cutting your melon on and then also serving it to your guests as well. What’s better is that this creates less mess and clean up! Always ensure you wash the outer skin of a watermelon prior to cutting it up. This ensures any dirt and bacteria on the skin isn’t carried onto the flesh. 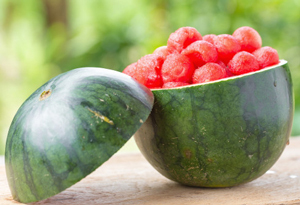 When using a basic knife, cut the watermelon in half to create a flat surface for both halves. Now rest the flat surface on a chopping board and cut it into smaller pieces as required. 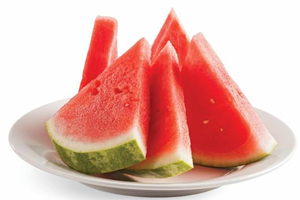 Many people opt to cut their watermelon into easily held triangles. Who knew there were so many different ways to cut up a single watermelon. Below you’ll find ‘5’ different ways you can cut your watermelon this Summer. Slice your watermelon in half long ways. Place the flat side of your watermelon on a cutting board. 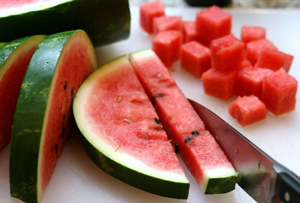 Make slices into your watermelon length ways. Each of these cuts should be approximately 1 inch wide. Now repeat the cutting process above although across ways. 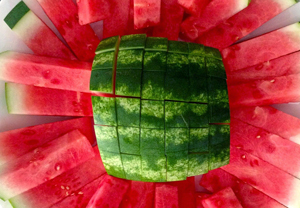 Your watermelon half should look ‘cubed’ from above. You have now created many watermelon sticks for the kids… and adults to enjoy. Repeat the process with the other half of your melon. This is the most common way to cut up a watermelon. Wedges are easy to handle and eat. Now cut your halves again. You will now have watermelon quarters. Cut these quarters into smaller wedges. Do you have an Italian themed party coming up? Why not create some watermelon pizza round. These pizza slices can then be dressed up on top with some salad for taste and display purposes. Slice directly downwards into your watermelon approximately 1 inch apart from the previous cut. Discard the two end pieces. You will now have round slices of watermelon. Stack multiple rounds of similar size on top of each other. Cut directly through the center once to make a semi circle. Now again to make 4 watermelon pizza pieces. 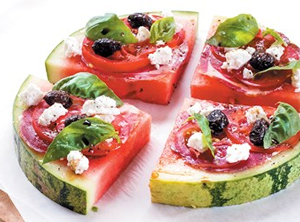 Place the watermelon slices back together to give the illusion of a watermelon pizza for your guests. If you have a child’s birthday party or special occasion coming up you may wish to make fun watermelon shapes for your guests to enjoy. 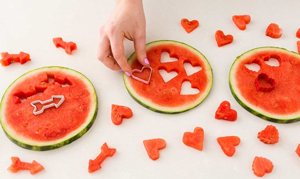 You’ll need to choose a cookie cutter such as a ‘star’ or ‘heart’ shape to be able to complete this watermelon cutting method. Slice your watermelon downwards into 1 inch rounds. Discard the two end pieces. Using your desired cookie cutter, press it into the flesh of the melon. Repeat until there is no usable flesh left. 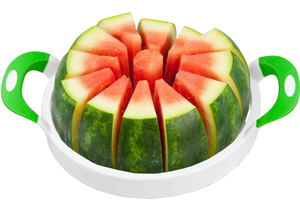 Serve your watermelon shapes on a plate or in a glass bowel. Watermelon balls are often used to make a simple watermelon cocktail or mocktail visually appealing. Others like to create watermelon balls and then display them within the watermelon shell. Slice your watermelon in half. Using a watermelon baller device, scoop your watermelon flesh into nice round balls. Serve them in a glass bowel or in the empty watermelon half. Cut watermelon in large round slices 1 inch apart from each other. Now cut downwards one inch apart from each other into your round slices. Simply cut the ends of each piece and create cubes by cutting across ways.